If you're constantly umm-ing and ahh-ing about whether to buy organic produce, the easiest answer might be: just have both -- of the right ones. The Dirty Dozen list for 2017 has been released, which outlines the 12 fruits and vegetables containing the most pesticide residue. For those who are wary of or worried about pesticides, the Dirty Dozen is a guide of what produce to avoid, and what produce is deemed 'safe'. To understand more about pesticides, the Dirty Dozen and the Clean Fifteen, The Huffington Post Australia spoke to Sonya Lunder, Environmental Working Group senior analyst and lead author of the EWG Shopper's Guide to Pesticides in Produce. "Pesticides are designed to kill insects, plants and mould or mildew. Many have shown to be harmful to people at high doses, yet they are applied directly to the food we eat, and residues are found on 70 percent of conventionally grown fruits and vegetables," Lunder told HuffPost Australia. "Pesticide rules were modernised in 1996. Since then the Environmental Protection Agency has withdrawn permissions for many of the most toxic insecticides on food crops, but is still considering new restrictions on those pesticides that are most toxic to people." The pesticide debate is long and ongoing. At the moment, the Environmental Protection Agency in the U.S. are deciding whether or not to ban chlorpyrifos -- an organophosphate insecticide which has been used since 1965 -- by the end of this month due to its link to brain problems in children whose mothers were exposed during pregnancy. Updated every year, the Environmental Working Group's Shopper's Guide Dirty Dozen list is based on laboratory tests done by the U.S. Department of Agriculture Pesticide Testing Program. "USDA tests a large number of fruit and vegetable crops each year for more than 100 pesticides, with an emphasis on those commodities highly consumed by infants and children," Lunder said. "Environmental Working Group reviews this data to provide consumers with a useful summary of these tests. We created the Dirty Dozen and Clean Fifteen lists based on notable differences between pesticide residues on different produce. "The list is updated every year to reflect new test data from USDA." The key findings for 2017 shine a negative light on the fruits and vegetables we consume most. "Nearly all samples of strawberries, spinach, peaches, nectarines, cherries and apples tested positive for residue of at least one pesticide," Lunder told HuffPost Australia. "The most contaminated sample of strawberries had 20 different pesticides. Spinach samples had an average of twice as much pesticide residue by weight than any other crop." While the Dirty Dozen list changes year to year, the list remains fairly stable because they represent long-term dynamics in pesticide use on fruit and vegetables, Lunder explained. "A crop like strawberries will always have lots of pesticide residues because they are vulnerable to pests, they grow directly on the soil, have a high water content and lack a protective outer peel," Lunder said. If you look closely at the Dirty Dozen, you will notice that the fruit and vegetables listed are typically those we eat unpeeled, or which come without a protective skin. 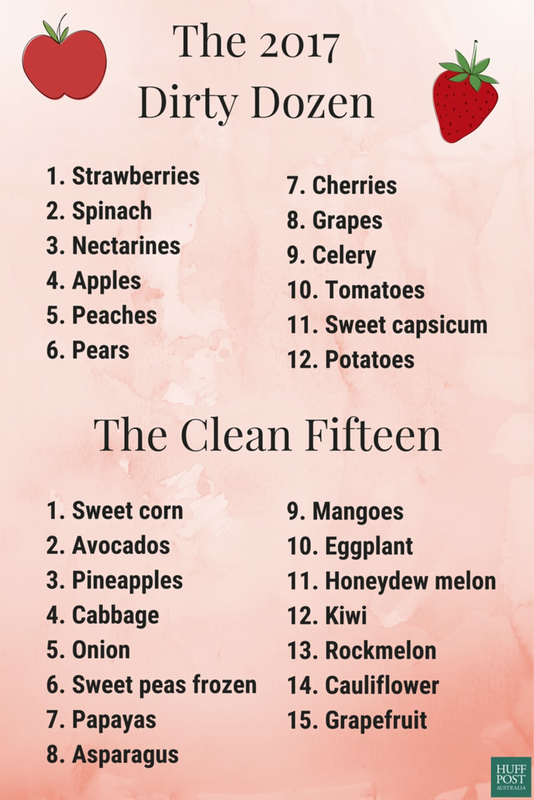 The Clean Fifteen list the opposing-type fruits and vegetables. Here's the full list of 51 fruits and vegetables with pesticide residue data. "We did detect a big change in spinach in the past year's samples. In the most recent years' testing for spinach, the USDA found significantly more pesticides by weight than prior years," Lunder said. "In fact, spinach has double or more the pesticide residues of other crops. We noticed relatively high concentrations of some new fungicides, as well an insecticide permethrin on spinach samples. In 2016, spinach was ranked number eight. Spinach jumped from number eight to number two on the list. "Pears have more residues in the recent testing, these are primarily fungicides. Also potatoes and cucumbers seem to trade off on the number 12 and 13 spot. Potatoes are heavily treated with one pesticide, while cucumbers have a variety." However, it's important that lists such as these don't deter you from eating fruit and vegetables altogether. 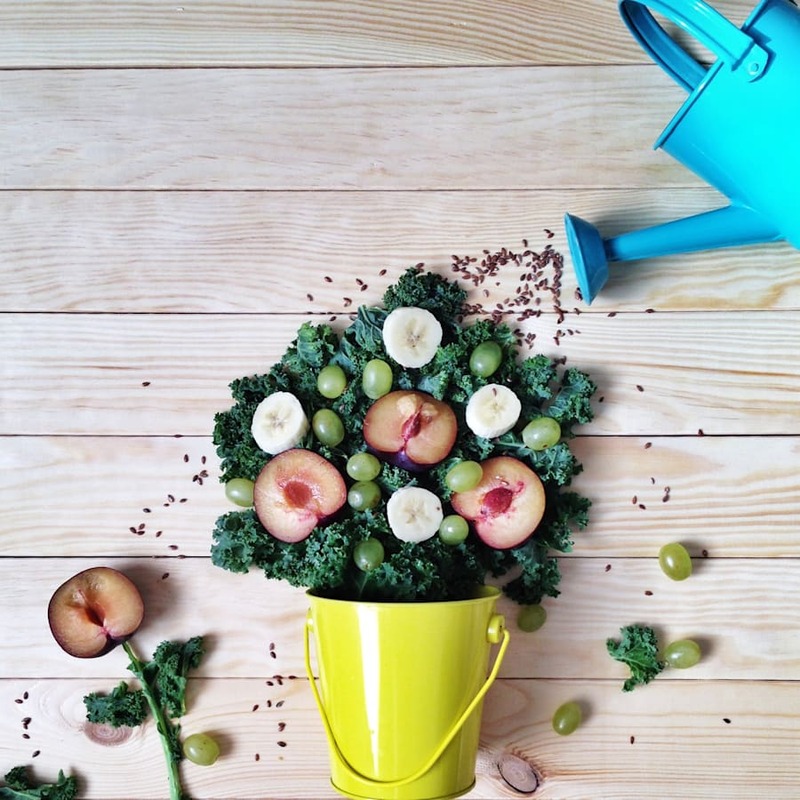 Fruit and veggies, organic or not, are a vital part of a healthy diet. If organic produce doesn't fit into your budget, try washing your regular produce in a large bowl filled with four parts water to one part plain white vinegar. Rinse well afterwards.